Milan looks like the busiest city in Italy, where everybody runs to their business meetings and has a full schedule day. Actually, I think that the capital of Lombardy should be slowly unveiled and reconsidered as a touristic place, like any other Italian famous cities, such as Rome, Florence and Venice. From fashion to design, from art exhibitions to Michelin-starred restaurants, Milan has a lot of highlights and different luxury locations for visitors, making this city also famous in the hospitality industry. Many luxury hotels have gorgeous suites for their guests, but where to book to find the best? I suggest you these six suite rooms for a very special night, a weekend or maybe more. Park Hyatt Hotel is few steps away from the Duomo cathedral, which stands up in the city center with its gothic architecture. 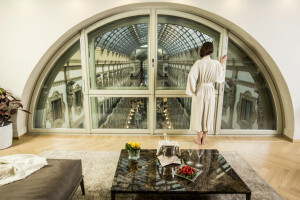 The five star hotel has recently opened the Duomo Suite: 115 square meters of opulence and romanticism with a terrace where a Jacuzzi covered by a golden mosaic of 50 thousands tiles gives you the possibility to admire the spiers of the church while having a warm bath. This suite is probably the most charming hotel suites for couples in the city. Maybe a 5 five star hotel is not enough for you. In this case… Milan boasts the only certified 7 star hotel in the world. The Seven stars Galleria Town House Hotel is located inside the Galleria Vittorio Emanuele II, in the heart of Milan, at the noble floor of the historical shopping mall. All the seven suites have a contemporary style with a stunning overlooking. Guest can have a personal butler in an absolute private atmosphere. All the major attractions and the fashion district are few steps away. 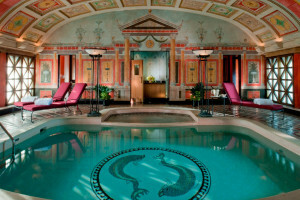 Celebrities, presidents and royalty have chosen the Presidential Suite at Hotel Principe di Savoia for their nights in Milan. This suite is 180 square meters, decorated like a luxurious pagan temple, with gold, wood and velvet. The suit boasts a fireplace, three bedrooms and a private spa with swimming pool, Jacuzzi, sauna and Turkish bath. From the windows you can enjoy the city skyline. 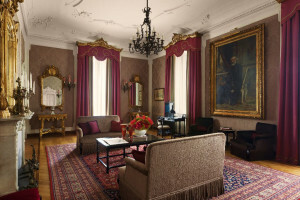 The famous Italian opera composer Giuseppe Verdi used to stay at this hotel and in particular in the suite of 110 square meters which has nowadays his name and is decorated with sumptuous carpets, elegant curtains, antique paintings, exclusive furnishings and the writing desk where Verdi composed the operas Othello and Falstaff. Why don’t you sit in front of the fireplace listening the masterpieces of the Italian classical music? Milan means fashion, ateliers and boutiques and Giorgio Armani plays without any doubts one of the leading roles among the Italian fashion designers. 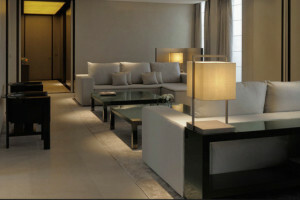 Once found the Armani Hotel, close to the most luxurious street of the city, via Montenapoleone, choose the 200 square meters Presidential Suite, on the sixth floor, overlooking the city skyline through the floor-to-ceiling glass windows. The suite features a full service cocktail bar and kitchen, a private study, dining room and a marvelous terrace along its entire length. It’s a new entry of the luxury hospitality industry of Milan: the Mandarin Oriental Milan Hotel is close to the fashion district and its best suite is the Presidential, on the second floor. The suite is distinguished by high ceilings and large, French glass-doors, sophisticated details that reflects the MO style with a touch of Italian elegance and features a relaxing bedroom, a wide living area and a private kitchen, a bathroom with Brazilian marble floor and, last but not least, a large bathtub.